Are you a business looking to get commercial ventilation for your warehouse or factory? Commercial ventilation is extremely important when you want to ventilate a warehouse. You need to make sure you know what your requirements are so that you don’t invest in unsuitable, powerless ventilation which won’t be able to handle a commercial building. We’ve had a number of inquiries at Roof Ventilation Blog about helping businesses determine appropriate solutions for commercial ventilation of factories, warehouses and other commercial buildings. Even commercial ventilation applications for schools, swimming pools, chicken sheds, commercial stables, office buildings and universities can find value in commercial exhaust fans. We’ll go through the steps so we can help you make an educated business decision on the right commercial ventilation solution for your industrial building. How many roof mounted ventilators do you need? This is one of the most asked questions for commercial ventilation on buildings. 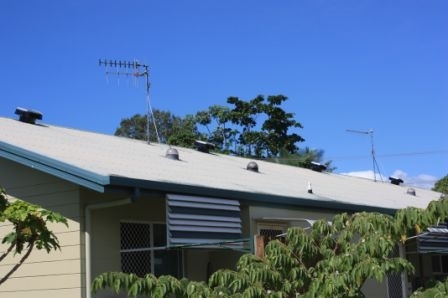 When you have a large sized building or a sizable collection of smaller buildings which are in need of some roof ventilation, you need to make sure you have some idea of how many units you’re after. There are a number of different types of commercial roof ventilation alternatives available in different strengths. So, as an example we’ll use the strongest alternative on the roof ventilation sheet chart which we posted not too long ago. So 3000 cubic metres of air can be moved, now if you own a factory – you’ll need to know the roof space (if any) and size of the factory itself. As the aim of commercial ventilation is to cool down and remove stale hot air from factories and roof spaces, the more often the air is replaced in the building, the better and more successful it will be. Without having exact figures and dimensions, we recommend that you never purchase a unit which doesn’t fully meet your air flow requirements. You’re better off getting an extra unit or different type of unit for your commercial ventilation solution and have it sufficiently ventilate the space in the commercial work space. Why ventilate commercial and industrial buildings? What are the benefits? A strong and successfully ventilated building can lower the growth of trapped heat, making for more eﬃcient temperature control and a more easy and clean workplace. Hot air developed throughout the day is taken out and replaced with the fresh, cooler and nicer evening air which, in turn, is kept in high thermal structures like concrete slabs. The following morning, hot air entering a building is reduced and then cooled by impact with the cold structures. Some workplaces give out pollutants which disrupt the clean air flow in commercial buildings (especially factories and pools). A natural ventilation solution would be favorable to remove moisture and condensation build up, and replacing them with clean and fresh air. This also allows for reduction of corrosion of buildings and their infrastructure keeping a clean environment for all the occupants. Ventilated buildings have been found to have up to 4 degrees lower than a non-ventilated building throughout the day. This therefore allows less use of the air conditioner and takes the pressure off the power bill. 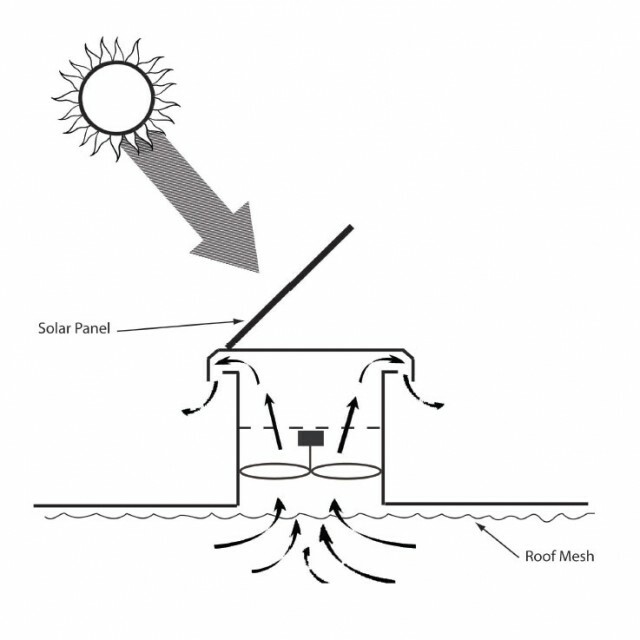 Not only would there be no running cost by utilizing solar roof ventilation for commercial ventilation, but on hot windy days it’s recommended that solar ventilation for commercial buildings is generally better so when the wind isn’t blowing but the sun’s up you’ll still get plenty of ventilation which will be more than necessary by midday! of smoke release vents which are often pneumatically controlled hatches with fusible links, which spring open in the event of high temperatures or smoke build up. They are costly and rarely used. Speciﬁcally designed natural solar powered ventilators can replace smoke release vents and perform both the function of smoke release and constant ventilation (but at a much more powerful level than wind ventilators) – a dual purpose, with assured return on investment. This is always favorable when looking to invest in a large amount of units for commercial ventilation. whirlybirds which are beginning to pop up in places like Bunnings and Masters) won’t do the trick. You’ll barely feel any difference and waste your time from beginning to end without commercial exhaust fans. There’s a bunch of alternatives out there for Australians so compare them and be sure to comment below how you went!